Essay: As in late 2004, we witnessed in late 2007 a crescendo of negative sentiment toward the US dollar. With everyone from Warren Buffett and George Soros to Mahmoud Amahdenijad and Hugo Chavez to model Giselle Bundchen and rapper Jay-Z maligning the dropping dollar, it doesn’t take much of a leap of contrarian analysis to call a near-term bottom in the dollar. As with many things, I think more clarity can be derived from stepping back and examining the long-term trend. Since 1968, when the Bretton Woods gold-linked currency system first started breaking down, the dollar has had remarkably regular long term cycles. From 1968 to 1978, it weakened; from 1978 to 1985, it strengthened; from 1985 to 1995, it weakened; from 1995 to 2002, it strengthened; since 2002 it has weakened. So far each cycle has been 17 years: 6 ½ years up and 10 ½ years down. The 17 year pattern can be broken into three phases: (i) the fast drop, (ii) the trading range, and (iii) the spike. 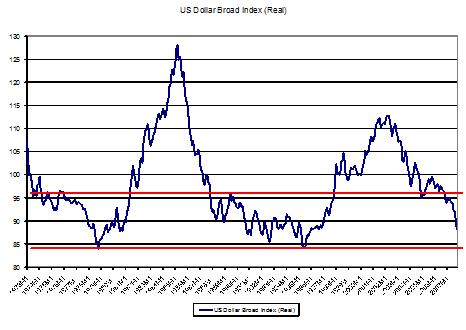 The fast drop occurs when the dollar falls from an overvalued position, evidenced by a wide current account deficit. The government (Treasury and the Fed) take actions to devalue the dollar, whether it be Nixon’s delinking the dollar from gold in 1971, the Plaza Accord in 1985 or Greenspan’s 1% interest rates in 2003. Usually during the fast drop phase, the US experiences a debt-fuelled LBO/conglomeration boom and a commodity price spike, and the global economy experiences a strong boom. Eventually, however, the Fed and Treasury are forced to take action to defend the dollar and limit inflation. These actions generally result in a market dislocation: the market crash of ’73-’74, the Louvre Accords and the ’87 market crash, the subprime crisis today. An increase in interest rates reduces domestic demand, while the continued low value of the dollar spurs exports, thus resulting in an elimination of the current account deficit. During the second phase, the dollar trades sideways-to-slightly-down in the long-term channel. During this phase the current account deficit is small and manageable and the real economy does ok. Inflation, however, remains elevated, eventually leading to policies that increase the value of the dollar. During the third phase the dollar enters a multi-year spike. High real interest rates and overt support from the Treasury draw an inflow of capital from abroad and an increase in the current account deficit. During the boom phase of the dollar spike, you see the US outperform the world economy. The US experiences a venture capital boom and emerging markets are beset by rolling financial crises. Commodity prices fall sharply. The strong dollar and the high current account deficit eventually lead to deflationary pressures, prompting the government to implement policies to devalue the dollar, and the cycle starts all over again. The chart shows that we are likely at a point similar to early 1973 and 1990, transitioning between the first phase and the second phase of the cycle. If the pattern holds, the dollar should spend the next four years in a sideways-to-higher trading range prior to one last drop to the bottom of the channel. While the economy has fallen into recession during each of the last two similar transitions, each successive crisis appears to be less severe. The long term channel does slope downward. 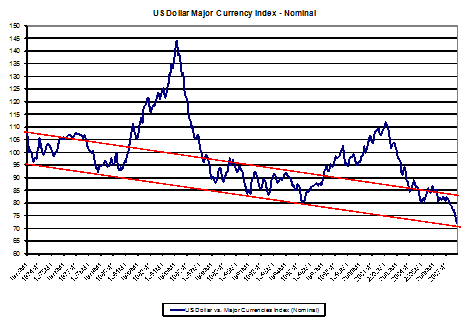 Plotting the long term trend, the dollar has been falling at a pace of about 0.5% per year since 1973. Why is it ok for the dollar to fall over the long term? Why shouldn’t it rise? A little historical context is in order. The value of the dollar prior to 1971 was set during the post World War II Bretton Woods conference. At that time, the US economy was the only major economy still intact following the war, and the US possessed around half of the world’s gold reserves. In addition, a huge chunk of the global economy was walled off behind the iron curtain or under self-imposed isolation like India. The economies of postwar Europe and Japan were a shambles, relying on funds from the US to rebuild. Given this situation, it is hardly a surprise that the US economy was so strong in the 1950s and early 1960s, even with high taxes and business regulation. As Japan and Western Europe recovered, however, the strains of international competition and Great Society and Vietnam era deficit spending created balance of payment pressures, leading Nixon to delink the dollar from the gold standard in 1971. If the historical pattern holds, the dollar is likely to rebound off today’s levels and trade modestly higher to sideways for the next several years. When the dollar is in the long term trading range, as it is now, the current account deficit has historically narrowed significantly or been eliminated altogether. In addition, considering where it has come from, it can be said that the dollar has held up remarkably well since 1968, relative to other currencies. There are plenty of things to worry about today, but at today’s levels the dollar need not be one of them.